«Оптические» компактные сушилки объединяют функции осушения, сушки и двухступенчатого конвейера в одно единое целое, специально для производства "оптического класса" продуктов, таких как линзы, подсветка ЖК-дисплея панели, компакт-диски и т.д. Они имеют ячеистый ротор для осушения, обеспечивая непрерывную и постоянную низкую температуру конденсации. В идеальных условиях, возможна температура конденсации осушенного воздуха ниже -40 ℃. 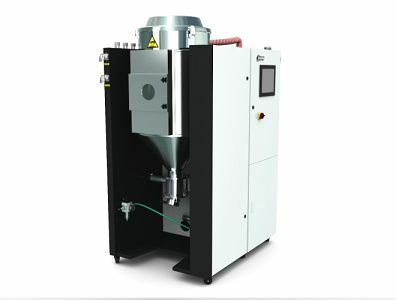 Combine the function of dehumidifying, drying and two-stage conveying into single unit. SCD Dryers Loaders are equipped with honeycomb rotor to obtain stable low dew-point drying air. It have two models: semi-open and hermetic. Feeding system is equipped with shut-off valve to ensure no surplus raw material in hopper tubes. Microprocessor is one of the standard equipment. Optical-class SCD-OP material contact surface are all mirror polished and collocates conveying system with closed loop to avoid contamination and moisture regain. Optical-class SCD-OP system has standard configuration of HEPA, which could filter tiny ion of 0.3μm with filter ratio of 99.97%. Heat preserved drying hopper barrel adopts down blowpipe design and collocates with cyclone air exhaust to avoid heat lost and improve drying efficiency. This dehumidifying series adopt double cooler structure to ensure lower return air temperature and dew-point value. PLC control and touch HMI are optional, making operation convenient for machine’s automatic running. Dew-point monitor is optional to monitor dew-point value at all times. 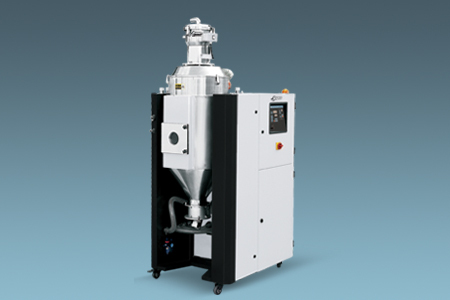 HEPA and optical-class storage hopper are optional to ensure no air contamination of raw material. SCD-ES series can opt for regenerative plate heat exchanger, which can save 3~6% power consumption. SCD-ES series can opt for drying plate heat exchanger, which can save 0~19% power consumption. Dew-point value is settable, dew-point value is set between -40 to +10℃ according to actual need of plastics material. 0~10% of total power consumption could be saved. The function of controlling drying capacity is optional. Once setting the name of dried plastics material and used volume of per hour, system would adjust air volume and consumption automatically. Volume used per hour can be set 20~100% as drying capacity to save the totally power consumption of 0~40%, achieving maximum of resources collocation and avoiding over-drying which affects physical and mechanical capacity of plastics material.